I first fell in love with the idea of split-hem pants after seeing this photo of Leandra Medine, a.k.a. the Man-Repeller, at Fashion Week last September. Her pants are Céline, which are likely long gone (and a bit out of my price range), but I've been obsessed with them ever since. While there are a bunch of similar styles flooding the stores, I have yet to find a pair that looks quite as good as hers (then again, it might help to have her rail-thin legs too). 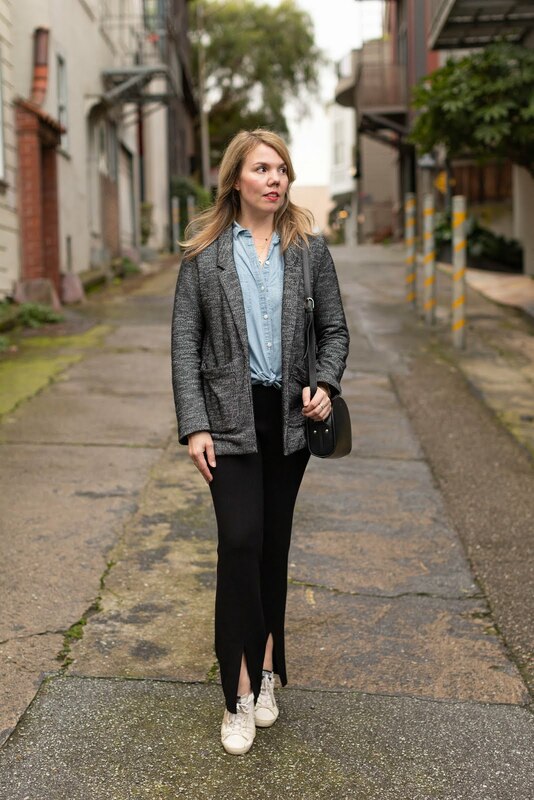 What I ended up with is a pair of thick-knit straight-leg pants from Zara, and since they are completely unlike anything else in my closet, styling them has been a challenge—although one I'm completely up for. 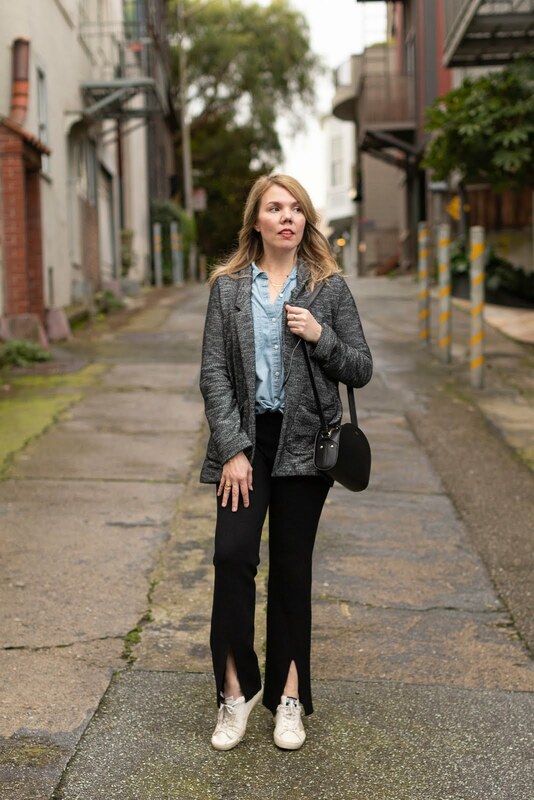 Here's what I've been wearing with my split-hem pants. After trying on varying cuts of split-front pants, I ended up going with a more straight-leg style from Zara; this is the most flattering cut I've found for my body type. 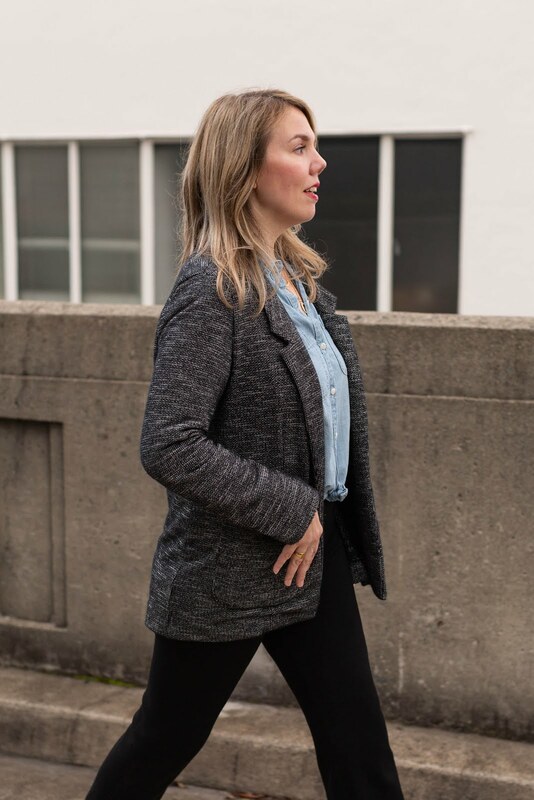 These pants are incredibly comfortable—the material is a thick knit, almost like a sweater; they're obviously thicker than the usual legging fabric, but they're not as supportive as a ponte knit. My hips are somewhat straight, with most of the curve of my leg happening in the upper thigh, so they almost look like a wide-leg cut on me, if that makes sense; the split hem gives them the appearance of a flared leg at times. 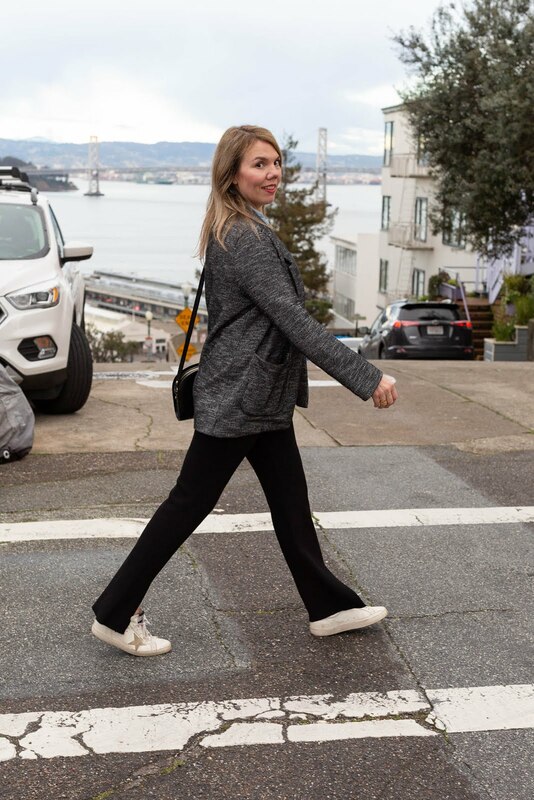 I think the slit detail is flattering, and it shows off your shoes; my one criticism of these pants is that I wish they held me in a little better, but overall, I think they're pretty flattering considering how comfy they are. For reference, I'm in a medium, which is what I almost always wear at Zara. I liked how Leandra styled her pants with a blazer, so I chose one of my favorites—you last saw it with mustard yellow. I love this one because it's knit, so it has the comfort of a sweater with the polished look of a tailored jacket. (And it's machine washable!) The weight is also great year-round in San Francisco; even though it's still a little chilly here, I was nice and warm wearing this one. It's unfortunately long since sold out, but I've linked similar styles below. As this outfit came together, I was sensing a bit of a menswear vibe, so I layered in one of my favorite shirts (last seen with denim). 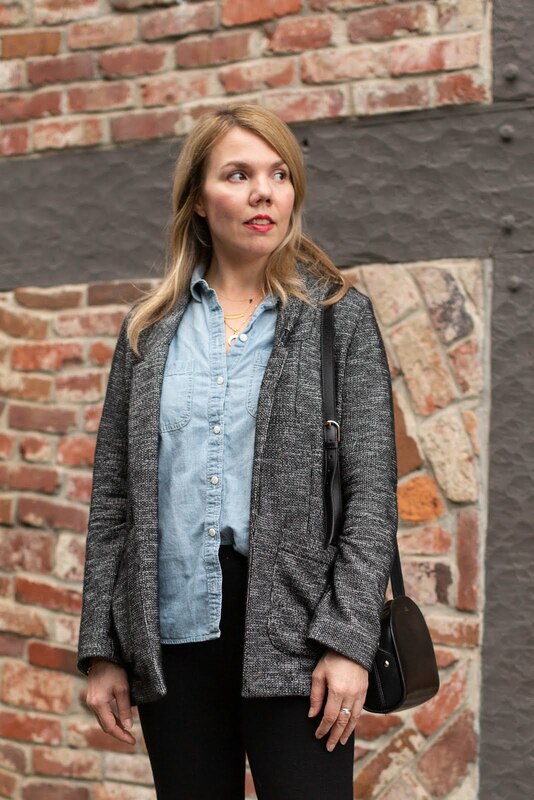 The chambray adds a little lightness and contrast to the otherwise neutral color scheme. I also started out with a quarter-tuck but then switched to a low front tie because I thought it looked kind of sloppy. Thankfully the blazer was long enough to skim over my hips and cover my bum. But back to the shirt—it runs pretty big, and I'm in a size small. Madewell sizing is often a head-scratcher for me. Accessory wise, you're probably sick of seeing my A.P.C. bag and Golden Goose sneakers, but clearly I am not. (Sorry not sorry—you last saw them together with a fur vest!) 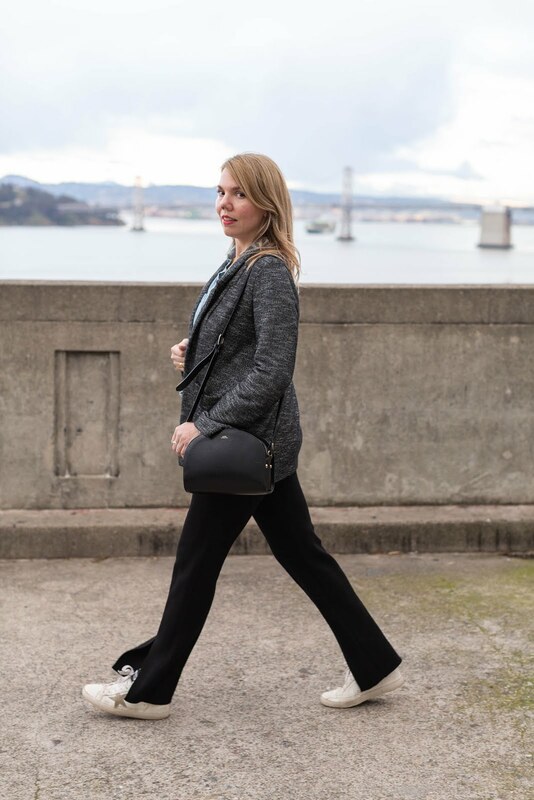 These pants benefit from a little lift, but I thought the rest of this outfit looked too fussy with a proper heel. Thankfully, these sneakers have a tiny hidden wedge heel, which is just one of the many reasons why I love them. 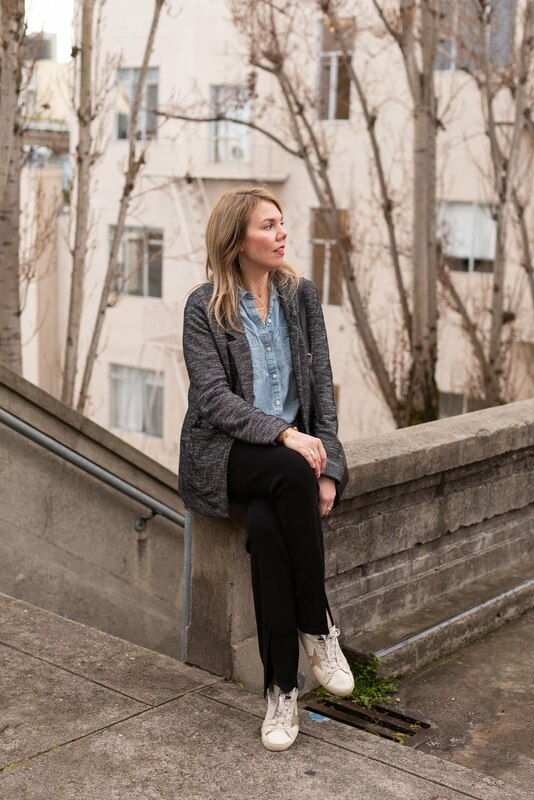 Like last week's post, we shot these photos in Telegraph Hill. (That's the Bay Bridge and Treasure Island in the background!) It was our first time doing a double-header, and it was kind of fun. I changed outfits in my car, which is apparently what a lot of bloggers do. I felt like a real professional...and a little creepy too! I have a pair of split hem jeans and just LOVE them! They are fun to wear with tennis shoes and heels for a more chic look! 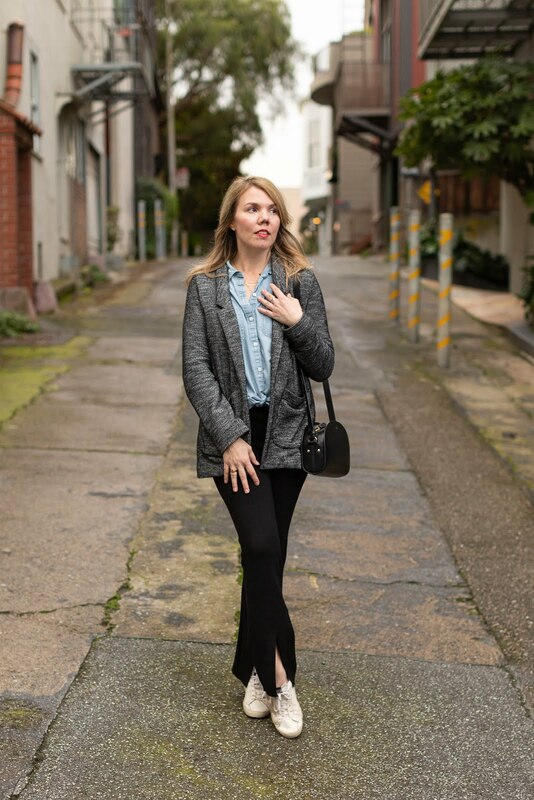 I've seen this style of pants on other bloggers and love how they look! I think they make your legs look even longer! I have 2 pairs of jeans with the split hem and love it! I have seen some pants on Mango and always loved this style, looks great with the sneakers and will with sandals. I think they are so fun.